Always stressed – What can I do about it? How the time flies! – A sentence that everyone knows. In our fast-paced world, time is running and we are running behind. To be in a place, but wanting or needing to be in another place, creates a gap which we try to close. This puts us in a situation that everyone knows: a stressful situation. Stress does not always equals stress. Basically, stress is a physical response to any kind of demands or threats. If you feel threatened – whether this is a real or imagined threat – does not matter – the body begins to produce stress hormones (including adrenaline and cortisol) to prepare the body for an emergency. This condition is called “fight-or-flight” mode. Stress is, so to speak, a protective mechanism. When we are stressed, the following happens with our body; blood pressure rises, the heart and respiratory rate increases, our digestive system and the immune system become less active, the muscles become tight and we have trouble sleeping. One can distinguish 2 types of stress. Eustress and Distress. Eustress is defined as short-term, positive stress. It acts like a motivation coach and encourages us to become active. If one is under mild stress, one is more productive, more focused, energized and attentive. This type of stress drives one to achieve its goals and increases performance. This type of stress is not perceived as a burden. 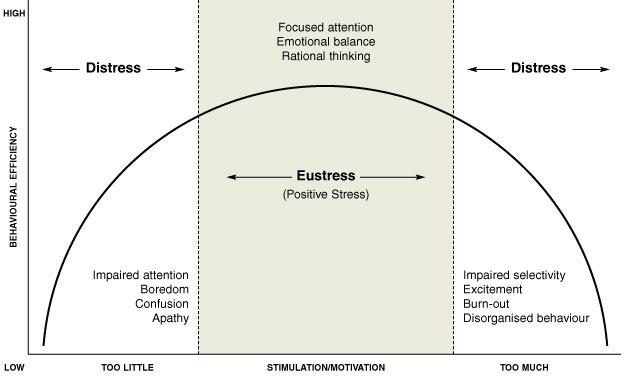 If the stress then increases and cannot be overcome, Eustress becomes Distress. Distress is also referred to as negative stress. This kind of stress is always regarded as a burden, by the affected person and can have negative mental and physical consequences. Stress is a risk to health if it occurs in excess and is not alleviated by regular relaxation phases. What is considered as negative stress varies from person to person. A negatively stressed person, feels that a situation is overstraining his powers and coping possibilities and does not feel that he can meet the challenges. If a stress situation persists over a long period of time it can lead to burnout. Triggers of stress reactions are called stressors. External stressors are, for example, heat, cold, tight spaces, noise, hunger or injuries. Internal stressors or psychological stressors are, above all, anxiety, time pressure at work, examination situations, overload or underload, high expectations and negative thinking patterns. In addition, life events, such as an incurable disease or a termination, the death of a family member can lead to distress. If you are in constant stress, it can make you sick. What can you do about stress and how can you prevent a burnout? Clarify tensions quickly to make sure they do not escalate. There are various means of stress management. It is the right balance between tension and relaxation that makes the difference. In the medical rehabilitation of stress-induced cardiovascular diseases, the “active relaxation” plays an increasing role: Patients learn, for example, by actively and controlled tensing and relaxing muscles, to reduce stress. Also, meditative breathing techniques, consciously used in stress moments, are extremely effective: those who focus on their breathing may dissolve disturbing thoughts or influences and thus create small resting-places in the midst of stress. Sport can also be used as a valve for pressure. In addition, you should try not to stress in your spare time, since that is often the time where you have the possibility to slow down and relax.